I somewhere, came across someone searching for an alternative to the muscle up. At first I thought it would be rather silly to look for something that replaces this fine movement, but the more I thought about it, I actually liked the idea of writing an article about it, since breaking movements down, often gives you a better understanding of how they are performed. What I suspect this posts ends up being, is actually both a guide to alternatives, but probably also; a guide that would enable you to train your way to the actual muscle up. There can be several reasons why you would be looking for alternatives to muscle ups. You may want to reap the benefits of the muscle up, without performing the actual exercise since you are either unable to perform it, or does not have the equipment available. Let’s start by breaking down the muscle up, which is done rather easily. It basically consist of a high pull up and the pressing part of a dip. I am very well aware of there being a thing, as the transition in between, but training/strength-wise and looking at alternatives to the actual movement, this transition phase is insignificant. Let us start with the pull up part of a muscle up. Anyone can see, that a muscle up is started by doing a pull up, but if the start of a muscle up is; just a pull up, then why aren’t everybody that are able to do a pull up, capable of muscle ups? Some will claim, that the reason for this, lies in the transition, that I just labeled, as being insignificant. You could also argue that the difference comes with the grip, as you, for the most part, will use “false grip” on muscle ups and regular finger/hook grip on pull ups. But then teaching any person capable of pull ups, false grip, should get them their muscle up; or at least in conjunction with teaching them the transition. This could happen; for the very few that actually have spend some time doing their pull ups all the way up, not just stopping at the chin, but pulling all the way till the chest touches the bar, or your shoulders are all the way above it. That is what really separates a regular pull up and the pull up that is part of a muscle up. Therefore drilling it down, in our search for alternatives to muscle ups, we need to have a pull up, that focuses on pulling ourselves as high as possible. But merely getting us there is not enough. We need to be able to stay in the top part of the pull up long enough to make the transition. Therefore wrapping up the pull-part, we need to perform a pull up bringing us as high as possible, preferably chest to bar and then making a 1 sec pause, at the top, before descending. The press part of the muscle up is, as explained earlier, pretty much just the pressing part of a dip. But there are some rather significant differences as we are trying to emulate the muscle up. When you do a regular dip, you for one thing often will not go much lower than your upper arm being parallel to the floor. But in a muscle up you will never, unless doing kipping muscle up, land in a position where your upper arm is parallel to the floor; you will be much lower. Therefore to emulate you need to go as low as you can in each repetition of your dips. 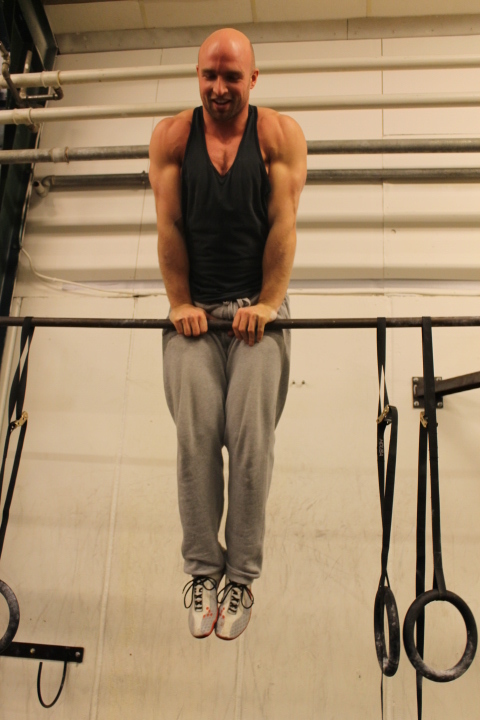 Just going really low, will be adequate to resemble the pushing part of a muscle up in rings, but if you want even more of an challenge, you should look for a straight bar or a table. Straight bar strict muscle ups are way harder, than in rings. You cannot put your body in between your hands, to gain a slight mechanical advantage. Therefore looking for a challenge when ordinary dips becomes easy, emulate the straight bar muscle up by finding a bar or a table where you can perform your dips. I would recommend that you keep your hands close together with your pointing fingers just touching and creating a 90 degree angle between them. These dips can be very demanding and challenging to do, as both strength and balance is tested, but your strength returns once you are able to go all the way down and up on these are incredible. To wrap this up, I will claim that if you have been training to do these alternatives and are able to pull you all the way to the bar and pause there, plus being able to push your way out of a low dip, you can with a few technical pointers actually perform the full muscle up movement. Next Post Trouble sleeping because of pre-workout supplements?